Bharat Sanchar Nigam Limited (BSNL) Chennai Telecom introduced new broadband under Combo plan. The BSNL Competent Authority has decided to offer new plan “BBG FN Combo 500 CS18” for only in Chennai Telecom District under Broadband Services. # Security deposit for local/STD/ISD facility and installation charges as applicable shall be taken from the customer. The rates indicated are exclusive of Service Tax, which will be charged extra as per prevailing bsnltariff. 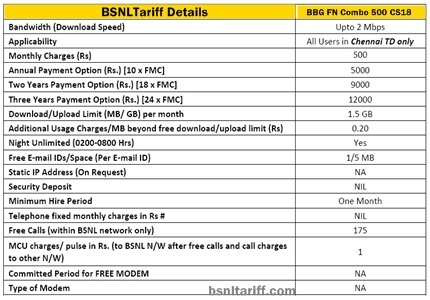 Since above plan is the reflected plan of the existing “BBG FN Combo 500” plan (with the only change as “Free calls to be offered as On-net calls only” and Off-net calls to be charged), therefore with the Launch of above plan, the existing combo plan “BBG FN Combo 500” shall not be offered to the new customers in Chennai TD. Existing customers falling under “BBG FN Combo 500” plan, who have completed more than six months in the plan, shall be migrated to new plan “BBG FN Combo 500 CS18” after giving an advance intimation of one month. The monthly charges for modems will be the same. The above offer will be effective from 21-09-2012 in Chennai Telecom District only.